I love rasam . Rice , rasam and papadam is a perfect combo for me when weather is little cold or when it is raining. And one day i came across this jeera rasam in Viji Varadharajan's book Samayal and liked it.It uses sambar powder instead of regular rasam powder with a little overdose of jeera. Its a digestive so very good to start a meal like a soup in my case i usually end my meal with rasam and rice. I modified the recipe to suit mine and my family's taste. Tamarind pulp - 1 tsp or a marble size , soaked in hot water. 1. Soak dal and cumin in warm water for 20 minutes. 2. If using tamarind soak it to separately for 20 minutes . 3. Grind dal and cumin with 1/4 cup of water. 4. Mix dal and cumin paste in 2 cups of water. 5. Add to it sambar powder, salt and keep on fire. 6. Simmer for 10 minutes and keep aside. 7. Heat oil and add hing and mustard seeds. 8. When mustard pops add cumin , red chilli , curry leaves . 9. Cook for 30 sec and pour over the cumin water. 10. And you are ready to serve. We second you Nisha..Rasam, pappadam and rice is a comfort food for sure during cold season..Jeera rasam looks yummy..never tried though..
oh Nisha, this rasam looks really yummy..I can just finish it in just one go! Simply Lovely! 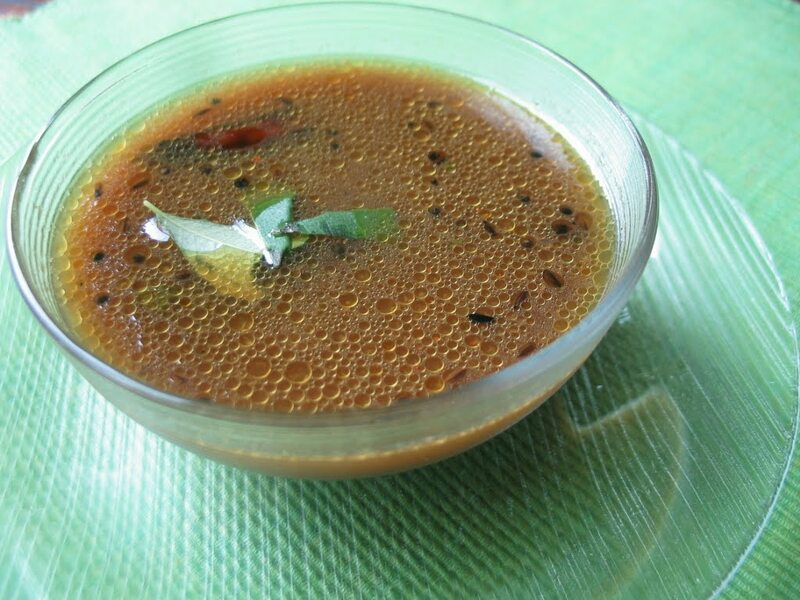 This is one of my favorite types of rasam, looks delicious ! Rasam looks very delicious,love to have this anyday with steaming hot rice..
rasam, pappad and rice is sure a great combo. Lovely pic of rasam.